With summer just around the corner, the team at MyTopFace is looking forward to tons of time in the sun (with proper SPF of course) and relaxing with friends. Along with this territory comes one unwanted companion, skin damage, and aging. From the sun to the not-so-great for your skin vodka sodas and ice cream, we will all soon be enjoying, it is time for us to start getting serious about preventive care. At MyTopFace our experts believe that prevention is the best policy! This is where the amazing rejuvenating Jivesse line comes into play. You don’t have to be aging to begin using anti-aging products! We got to try three of their products, all centered around promises of advanced collagen production and a more youthful glow. Collagen has been a buzz word lately. Beauty experts and novice alike can’t stop talking about its restorative beauty properties. While many have been talking about the benefits of drinking collagen, we think there is nothing quite like the effects of just adding it to your morning and nightly skincare ritual for that elasticity and firmness we begin to lose with age. 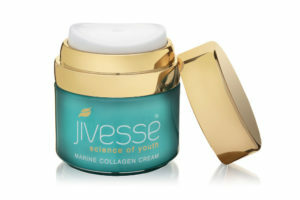 We added the Jivesse Marine Collagen cream to our skin care ritual and were impressed by the results. We will take this moment to remind you if you are not already cleansing and toning every night and morning before you moisturize, start! Your skin will thank you with its luminous glow and reduction of break-outs. 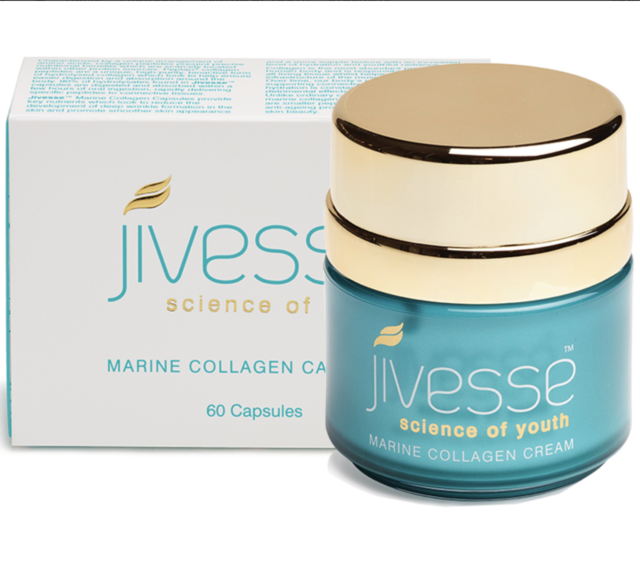 Upon first impression, our jar of Jivesse Marine Collagen Cream has a particularly fantastic applicator. The pump makes it easy to get the perfect amount of cream onto your fingers and ready it for your application. This pump does double duty, with the design also creating an airless insuring the purity of the product. This gives you the most impactful effect of the amazing array of active ingredients Jivesse includes in its product range. Easy does it with the portions of this cream, a little bit goes a long way! Starting off by noticing the ease with which it glides onto your skin and then absorbs seamlessly, we automatically know this cream has a luxe quality behind it. This is due to the unique blend of marine collagen enriched with Peptan® fortified with an antioxidant and humectant, a combination that promises a youthful glow and deep line reduction. MyTopFace experts have tried tons of creams but none that have made our faces feel this baby soft instantly and then continue to work throughout the day. Unlike a large number of creams, it is not oily or sticky, so it can be used in both the morning and night if you are looking for a twice daily solution and have a combination or dry complexion. The next morning we applied again and our makeup went on more smoothly and by now we are already seeing the improvement on soft lines in our under eye area Once you have prepared your skin you can apply makeup like a guru with this tutorial. After our third day adding it to our ritual, our skin had more elasticity, felt fuller and more plump with noticeable fine lines beginning to fade like with our favorite Instagram filter, but in real life (isn’t that the dream?! ). This cream has been a total win in the MyTopFace expert’s book and we can’t wait to see the long-term effects of its use on our complexions. We would recommend this moisturizer to anyone looking to restore a bit of their natural plump and glow! MyTopFace Hack: You can use Jivesse Marine Collagen cream not only as a night/day skin care routine but as a perfect makeup base without primer! Another great aspect of this product is if you’re someone who struggles with acne or acne scars this cream is for you. The product is formulated to renew and boost your skins restructuring process and wipe out those very pesky acne scars. 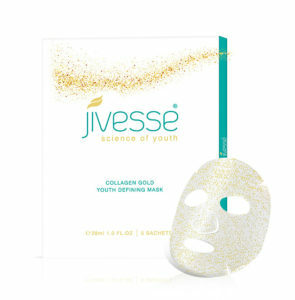 The next night after a long New York day trying the Jivesse Gold Collagen Face Mask seems like a perfect fit into our evening. Paired with a big glass of red wine and a movie on Netflix we prepared to relax in our own personal mini spa and let the mask do its 15 mins of reparative duty. These masks are no joke! Each one is infused with 24 karat gold leaf and a collagen serum. With promises of being a safer alternative to botox, we had high hopes for these masks. Needless to say, we were not let down by this miracle product. We carefully took the mask out of the package and tapped down the sheet over our face smoothing the creases of its paper-like texture until it is flush with our skin. This mask sticks to the skin in a much more secure manner than a majority of other mask brands, making it feel easier to move around while still doing the treatment if need be. 15 minutes after applying this mask the MyTopFace experts can feel a newly soft to the touch feeling with our skin. We look flush and hydrated with a healthy glow. The 24 karat gold leaf used to create these masks promises reflection of light and to step in to protect against discoloration. From using this mask once we can honestly say it did this for us. We were left with an impressive glow and could see some of our sun spots fading. The mask also is incredibly hydrating and left our skin feeling so fresh! We didn’t even want to put on makeup over our newly developed glow! MTF experts would definitely recommend using these pumping/ glow infused packs before a big night or even a special event! 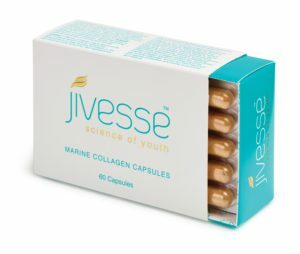 Last but not least we have begun taking the Jivesse Marine Collagen Capsules along with our normal arsenal of vitamins in the hopes to begin our anti-aging process from the inside out. We just have to say if these capsules work as well as the rest of their product range we won’t be disappointed! Adding Jivesse into your daily routine with their moisturizer, capsules, and masks will certainly restore some plump, fill and hydration to your skin. But we can not stress enough that anti-aging products are not just for the old! Starting to use the Jivesse line now can prevent major damage in the future! All products mentioned here can be found on the Jivesse website or in Harrods department stores.